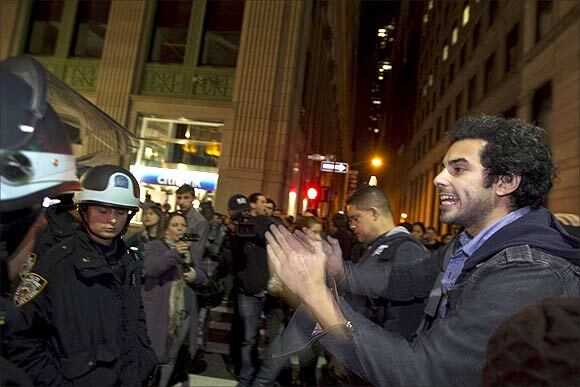 Rediff.com » Business » Occupy Wall St: Who will meet protestors' demands? 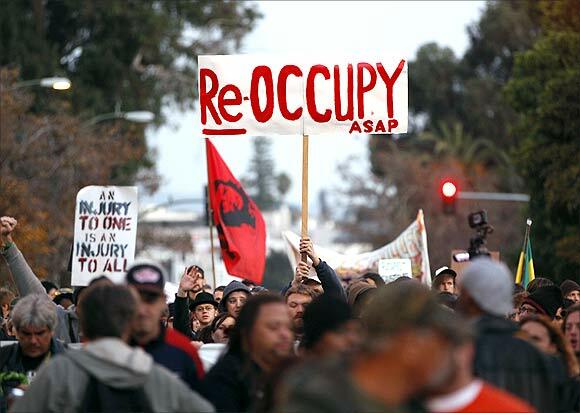 Occupy Wall St: Who will meet protestors' demands? 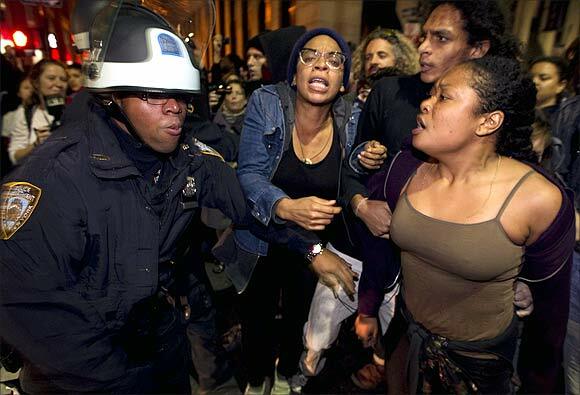 Removing Occupy Wall Street protestors from New York's Zuccotti Park in a late night raid may have been easy enough. Clamping down on the global rage against various abuses of power will be difficult, perhaps even impossible. The current wave of anti-capitalist protests is now being compared to the historic workers' uprising, known as Spring Time of the People, which rocked the whole of Europe in 1848. It is also being likened to the anti-establishment agitations that swept through the western world in 1968. In both cases the power structure was not immediately and visibly altered. But both the 19th- and 20th-century events had a profound impact on subsequent decades. Last week's police actions against the 'Occupy' encampments -- from Oakland to New York in the United States -- will not snuff out the underlying energy. 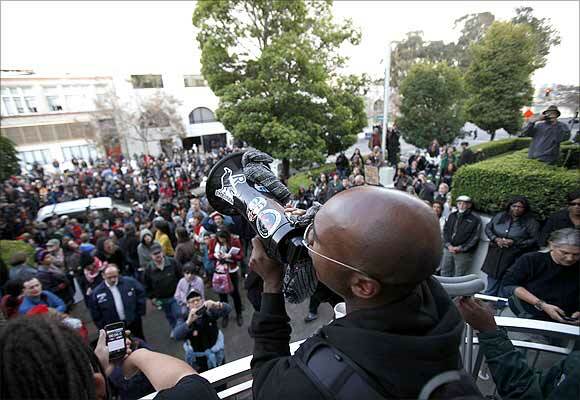 "You cannot evict an idea whose time has come," said the Occupy Wall Street protestors, after their camp was uprooted. That 'idea' is broadly a determination to take on the economic and political forces that are plundering our world, wrote one commentator on the NationofChange web site. This is an independent platform for publishing news and views on a wide array of such struggles. Mainstream media criticised the protestors for not being more specific about their demands. But asking for a reduction of influence by vested interests in the framing of regulations is a specific enough demand. However, disputes about the sharpness of protestors' demands are not the crux of the matter. Future events might depend on addressing a more fundamental contradiction that the protests have brought to the surface. What if neither governments nor specific groups of private interests have enough control to steer globally mobile markets and related economic trends? In this context there is merit in listening to some of the voices rarely found in the mainstream media. One such voice is John Bunzl, founder of the International Simultaneous Policy Organization, a group that seeks coordinated solutions to global problems. While admiring the energy and the intentions of the protestors, Bunzl has questioned the basic assumption that there is someone with the power and ability to meet any demands. "In our globalised world, destructive competition between governments means that there is no one in the cockpit of our global economic plane," Bunzl recently said in a group email discussion. "De-regulation has taken on a momentum all its own," he wrote, adding, "a momentum no individual nor small group of governments can now stop." Thus, even the European Union appears to be powerlessness in relation to global bond markets. There are individuals in government and corporations who would agree with this assessment but hesitate to say so in public. This was clearly manifest at the World Economic Forum's (WEF) recently held India Economic Summit in Mumbai. In private discussions some individuals took stock of how frighteningly complex and out of control the global economic situation has become. But in most formal meetings there was little or no discussion of any fundamental flaws. The entire gathering was premised on the assumption that growth can be made socially inclusive and environmentally sustainable -- and thus the future is bright. But how can this be done if free markets are only lightly regulated? Interestingly, one of the answers that was floating about at the WEF event was quite similar to what relatively radical thinkers like John Bunzl favour -- namely, many forms of global cooperation rooted in humane values. All participants at the WEF received a booklet, titled Global Economic Ethic: Consequences for Global Business. This is a manifesto published by the Global Ethic Foundation, which was founded by a German, Count Karl Konrad von der Groeben, in 1995. The Global Ethic Foundation's work is premised on the observation that a business ethic based on values that would overcome these 'sins' is still in its infancy. Its manifesto identifies the core values on which business should be based -- cooperation, human rights, respecting the dignity of all, non-violence, justice, solidarity, honesty and tolerance. 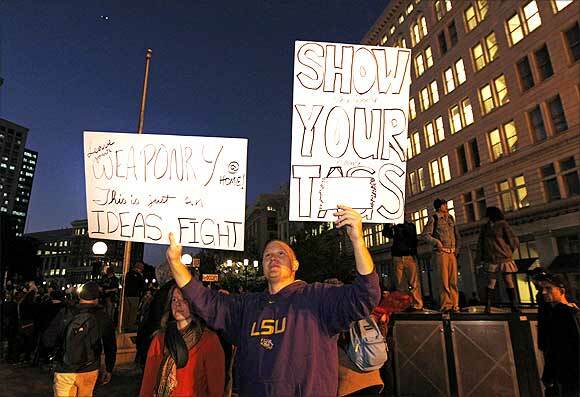 Each of these is a value that the protestors at any of the 'Occupy' movement locations would fully agree with. A wide array of prominent people has even signed the manifesto. Among them are A T Ariyaratne, founder of the Sarvodaya Movement in Sri Lanka; Prince El Hassan bin Talai of Jordan; Georg Kell, executive director of the UN Global Compact; Jeffrey Sachs, economist and director of The Earth Institute; Juan Somavia, director general of the International Labour Organization; Desmond Tutu, Archbishop Emeritus and Nobel Peace Prize Laureate; Daniel Vasella, CEO of Novartis International; and James D Wolfensohn, former president of the World Bank. However distant the realisation of the manifesto's vision might be, it is significant that no one would openly oppose it on a public platform. Much of the networking and deal making at WEF may not foster these values. And yet the circulation of such a manifesto raises the bar. This might be a healthy paradox. The 'Occupy' protests may yet fulfil a historic function if they trigger a more active engagement by a wide range of people to explore just what is keeping these values from being manifest in the global economic system. As always the most critical role will be played by those who are inside the system and have the courage to speak out on various inconvenient truths. Will Sister Valsa John's sacrifice go waste?